In the photo: Professor Michael Aguilar and team members Ben Director, Brian Bartholomew, James Williams, Hailey Jacob, Meiyao Tysinger, and Dashiell Mace. Each year in UNC Economics, a team of three to five advanced students undertakes research and data analysis on US monetary policy under faculty supervision. Their goal: to devise the most effective monetary policy for the US to follow in the coming year. This is not an abstract exercise, but a competitive event. The Federal Reserve Board of Governors, the US monetary authority, sponsors an annual competition for students from universities across the nation. Each university nominates a team, and those teams compete in region competitions. The winners of those competitions advance to district tournaments; the winners of district tournaments compete for the national title at the Federal Reserve in Washington DC. At each level, the teams are evaluated on two criteria: the logic of the monetary policy proposed, and the ability of the team to present the policy and answer critical questions about the policy. At each stage of the competition, judges choose the best team on these two criteria and send the winner forward. 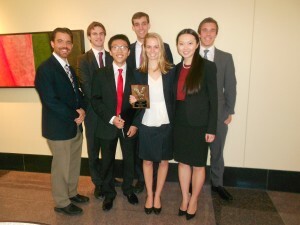 Carolina’s Federal Reserve Challenge Team has made a habit of winning in this competition. It has won the region competition (North and South Carolina) in seven of the last eight years, and has won the District competition (sponsored by the Federal Reserve Bank of Richmond) three times in those eight years. In each of those three years, the team qualified for the national competition in Washington. The Fed Challenge is a tremendous learning experience for our undergraduates. There are two teams involved: the five-member competition team presents their monetary policy advice and responds to questions from the judges. The ten-member research team are younger students who contribute to the monetary policy advice and provide critiques to the presentations of the competition team. They are through this process also competing to step onto the competition team in future years. All of these students are learning lessons not only about macroeconomics but also about working in teams and presenting ideas effectively. This extracurricular activity is one that UNC Economics could not offer without the support of private donors. We are grateful to Herbert Brown Mayo for the creation of the Herbert B. Mayo Undergraduate Research Fund that helps defray the costs of team competitions. We are also very grateful to Professor Michael Aguilar, the faculty advisor to this team. Has the UNC Fed Challenge won the national championship? Not yet. Their performance continues to improve each year. 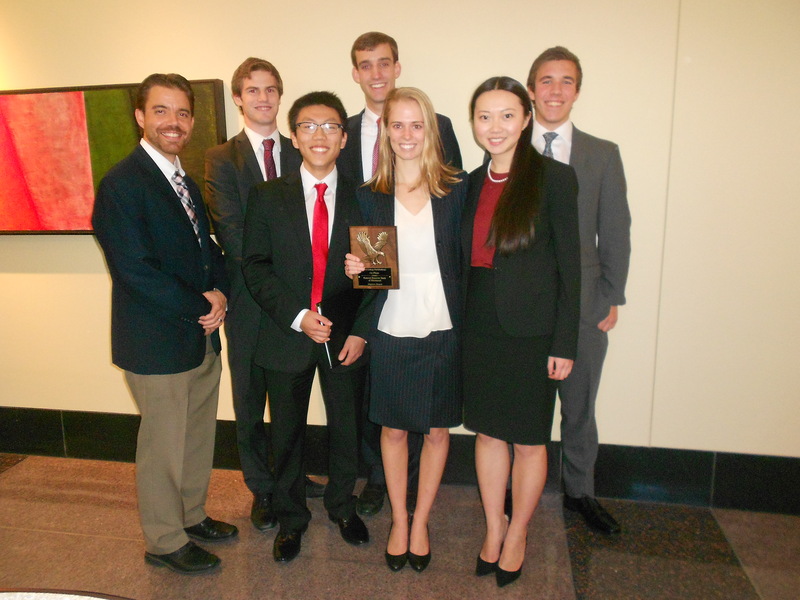 In fall 2015, the UNC Fed Challenge won a ten-team competition at the Region 3 level. It won the District competition in Richmond, and took its show to Washington for the National competition. This time around, UNC captured second place — the team’s best showing yet. Pace University won the competition, and Princeton University was among the teams behind UNC.